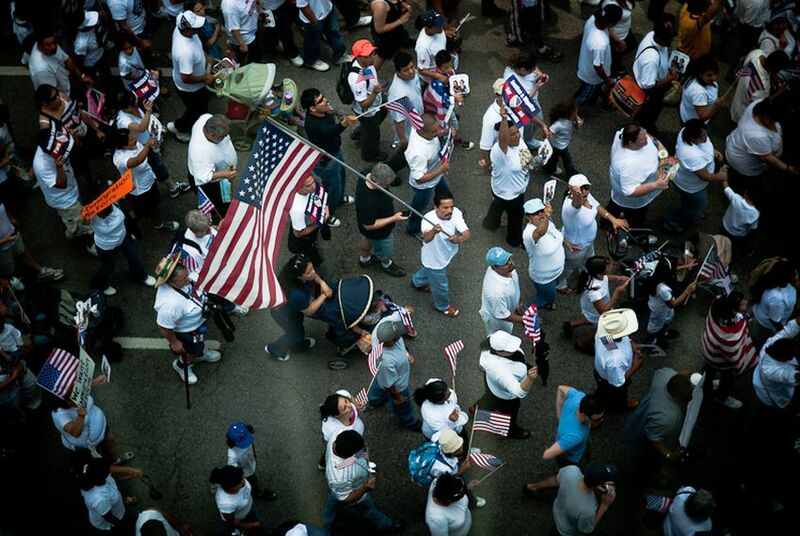 To the sound of drums and the sight of American flags, more than 25,000 people marched on Dallas City Hall in the latest episode in Texas' endless immigration saga. To the sound of drums and the sight of American flags, more than 25,000 people — a microcosm of a national movement — marched on Dallas City Hall on Saturday in the latest episode in the never-ending Texas immigration saga. More than 50 additional Dallas County sheriff’s deputies, 300 tactical Dallas Police Department officers and 50 volunteer security guards were on hand to quell any violence, though by all accounts the rally came and went without major incidents. The marchers pleaded, as did several thousand of their ilk across the country at similar rallies, for federal immigration reform — on the heels the passage of an Arizona’ law that many have called a “police state” bill, in the midst of a turf war between Mexican narcotraficantes, and against a backdrop of a reeling economy in which state services could face the budget ax. That doesn’t mean, he added, that he supports Arizona-style legislation, which allows local police officers to demand proof of citizenship on suspicion of illegal status. “I am respectful of this country, but I don’t want anybody thinking that just because I have this color, that they are going to stop me and ask me if I have legal papers or not,” said Gutierrez, who was born in Michigan and reared in the South Texas town of Pharr. Just across the street, Vincent Gallagher urged tolerance. “We are a country of immigrants," he said. "The Hispanic communities have been here longer than the Anglos, and I am Anglo, being an Irishman. I think it’s terrible that we are drawing a line in the sand and saying, 'You can’t come across. '” Gallagher, who became a U.S. citizen in 2001, wore a legalizetheirish.org shirt. He said the movement wasn’t just about Hispanics but that their plight called attention to the need for comprehensive immigration reform. Instead, he said, the government should close its borders, crack down on businesses that hire undocumented workers and move on. The crowd grew louder, as if on cue, as it marched passed the Sheraton Hotel’s service entrance, where a flock of low-wage earners in uniform at the high-end hotel urged on the marchers. The march culminated with political leaders and marchers congregating at City Hall, whose windows reflected a sea of U.S. flags, waving to Ray Charles' rendition of “America, the Beautiful.” State and local leaders from Dallas, including Bishop Kevin Farrell, state Sen. Royce West, and state Reps. Rafael Anchia and Roberto Alonzo urged solidarity in Texas' path to reform. Alonzo lauded the marchers' efforts and insisted that Texans need not worry that an Arizona-style bill would move through the state Legislature. “This is an issue that is not on the table,” he said.